Mountfitchet Castle is a unique time capsule. With its commanding position overlooking the Stort Valley, the Castle is situated on its original site which is steeped in history. 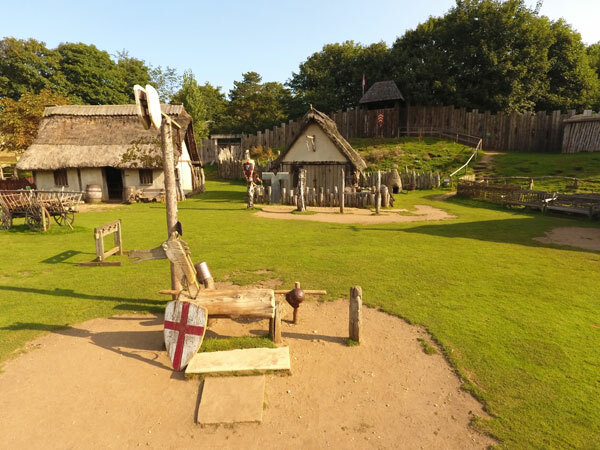 Formerly an Iron Age hill fort, this historic site was also a Roman signals fort and later a Saxon and Viking settlement before being attacked in 1066 by William the Conqueror who built a wooden Motte and Bailey castle here. Mountfitchet Castle was also briefly used by the Royalist Army to King Charles in the English Civil War (17th C). The Royalist forces held out at the castle when they were laid Siege to by Cromwell. Soon after, the Motte and Bailey castle lay in ruins and the site was taken over by nature and became covered in dense scrub, trees, brambles and bushes and laid totally forgotten until 1975 when the owner, Alan Goldsmith, had a dream to rebuild and restore the castle to its former glory. 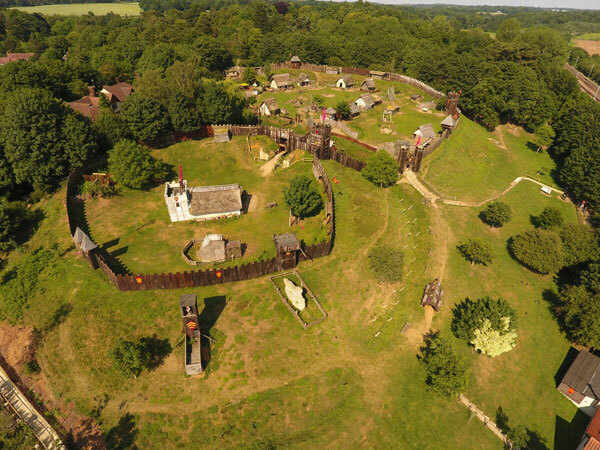 The grounds were cleared to reveal the original earthworks and mounds and after years of battling with planners, in 1980 the work began to reconstruct Mountfitchet Castle. After many years of work, the restoration of Mountfitchet Castle was complete and was opened to the public in 1985 and is unique as being the only wooden Motte and Bailey reconstruction on its original site anywhere in the world. This historic castle enables the visitor to travel back in time to 1066 Norman England. Explore the Castle and roam through the Norman Village hidden behind the castle walls, wander in and out of the many houses and view the scenes, smell the log fires burning and experience the ambience of an ancient bygone lifestyle. A living history, hands-on and interactive experience. Come and mingle with the animals that roam freely throughout the castle grounds and listen out for the echoes of long-forgotten voices…………..